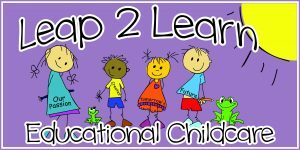 Leap 2 Learn provides a high-quality early education and care programs. The beginning of wonderful memories starts in our infant room. Our babies daily needs are addressed with smiles and frequent eye contact. Loving interaction between baby and caregiver is given during diaper changes, feedings, rest time, and playtime. Babies are talked to about what they are seeing and experiencing thus encouraging their vocabulary development. Songs are frequently sung and soothing music is played during naps. There is plenty of cuddle time and babies are given plenty of individualized attention. Parents are kept up to date with a digital daily sheet that reports feeding times/amounts, diaper changes, nap times, and activities that occurred each day. The team is responsive to each parent’s concerns and suggestions and baby’s achievements are joyfully shared. Our room resembles a relaxing home atmosphere with age-appropriate toys, bouncers, and a comfy rocking chair. Each child has their own cubby for personal items and separate sleeping space for added comfort during naps. There is adequate space for the team to sit on the floor with baby during play. Your child’s happiness and comfort is our first priority as we provide you with a safe and secure program. In this classroom, the children are introduced to a small class routine. The routine is flexible and is adjusted to meet the needs of the child. They begin to eat, sleep, and play at the same time. This schedule allows predictability and a feeling of security among the children. The students are introduced to colors and shapes, encouraged to play cooperatively with their peers and the teachers continuously praise and model appropriate behavior. The students are nurtured and comforted throughout the day. This nurturing environment provides the structure that allows the students to grow and learn while feeling safe and comfortable. Students are given daily opportunities to explore and learn through age-appropriate toys and projects. Children in this program are encouraged to try to use their words to express their needs and wants. We begin to transition from bottles to sippy cups. The children are encouraged to play cooperatively with their peers and the teachers continuously praise and model appropriate behavior. The students are nurtured and comforted throughout the day. Each child’s day is documented in real time with our KidReports that explains toileting, eating, and rest time. The weekly themes in this classroom promote independence through child-centered and teacher-directed activities throughout the day. Self-help skills such as eating skills, toilet learning, hand washing, and independently cleaning up are among the skills taught in this room. Each child’s day is documented in real time with our KidReports that explains toileting, eating, and rest time. This program introduces students to circle time activities including calendar, weather, counting, story time, and songs. The age-appropriate activities in this classroom promote taking turns, cooperating, sharing, and expressing feelings in an appropriate manner. What makes pre-school fun? What makes a child want to learn? It is a program like ours. Our safe and enriching program focuses on all aspects of learning. Hands-on activities encompass exciting monthly themes which include nutrition, cooking, holidays, dinosaurs, and safety, to name just a few. A child’s feeling of independence and social interaction with others is important during this time. Children learn to help themselves and to make friends, share and communicate with their friends. We continue to encourage the use of the bathroom on their own, although assistance is given if necessary. Their individuality is celebrated. During the course of the day, children are encouraged to make choices for themselves, cooperate with others as well as listen and follow directions. We offer time to explore a variety of learning centers, which offer items to help stimulate young minds. They work on their handwriting skills (starting with their name), colors, shapes, and numbers. This also gives each teacher the opportunity to work one-on-one with each child. Literacy is also introduced with the letter of the week and circle time interactive readings. During Circle time the calendar is introduced helping them learn the days of the week and the months of the year. Patterns, graphing, simple math and science activities are included in the weekly activities. Each child’s day is documented in real time with our KidReports that explains toileting, eating, and rest time.